One of my life verses is 1 Peter 3:15, “But sanctify the Lord God in your hearts, and always be ready to give a defense to everyone who asks you for a reason for the hope that is in you.” That charge is something I have taken to heart and something I want to help others be able to do. I hope to equip believers of all ages to be prepared and confident to give a reason for the faith they have, and in so doing, increase their faith. I plan to teach on foundational issues such as creation, evolution, science, the age of the Earth, and the reliability of the Bible, plus many others that are consistent with God’s Word and relevant to today’s troubled times. This will build a Biblical foundation that will endure assault. I want to get kids and adults involved in this. I also want to help families help each other learn more about God and His Word. I would like to see primary care givers (e.g. parent, grandparent) involved in discipling their child, which will in turn, allow him or her to grow at the same time and strengthen the bond between adult and child. Two-thirds of young people are walking away from the church (and their faith) upon reaching college age. According to the research, about 40 percent are becoming disengaged during middle school and even elementary school. Combine those statistics with the fact that in the 2016 election, the majority of voters under 45 voted for an ungodly and unbiblical platform, this nation is in serious trouble unless revival happens across the country. Research has also shown that when children and youth are given solid biblical teaching on the issues I mentioned, they are less likely to leave the church. 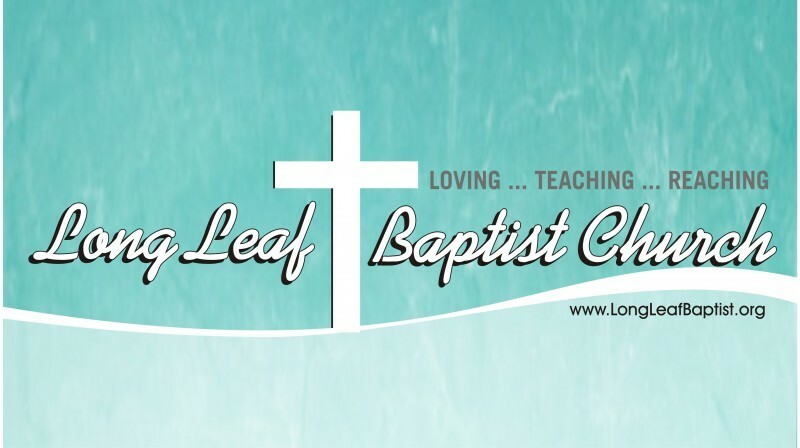 Please pray for this part of the ministry of Long Leaf Baptist Church, and I pray God's blessing in your life.